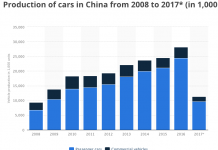 China is currently the largest car market (CARZ) in the world. 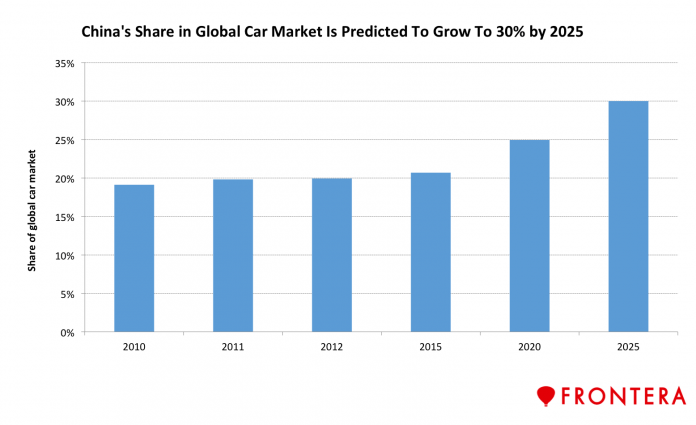 Industry experts have been keeping a close watch on growth in China’s (FXI) automobile market as it forms an increasingly large share of revenues and profits for global automakers. In 2016, car sales in China grew at their fastest rate on record, but are expected to slow down this year due to unfavorable new tax policies for buyers. In April 2017, China’s auto sales fell the most in the last two years largely due to a hike in taxes on small cars that led to lower demand. Vehicle sales in China declined by 2.2% in April to 2.1 million units after a 4% rise in the previous month. 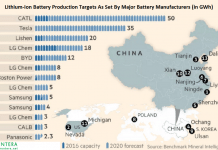 By 2025, China aims to sell 35 million cars a year, which would account for 30% of the global car market. 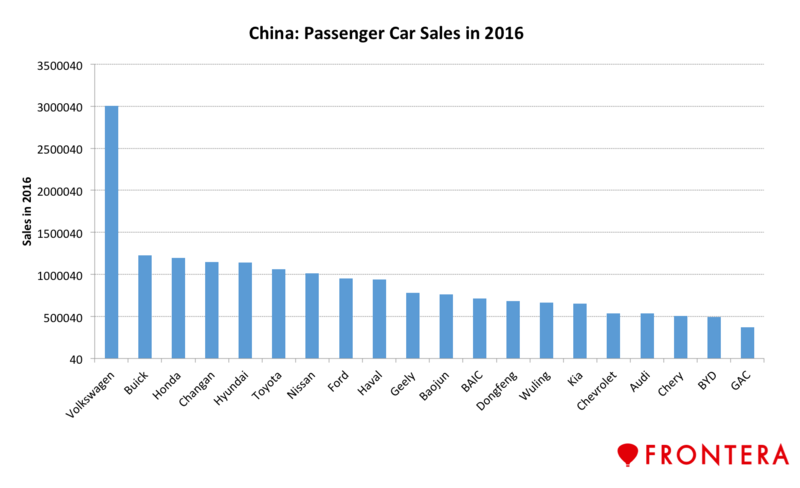 Meanwhile, the top five domestic manufacturers in China are Shanghai General Motors, Dongfeng, FAW, and Chang’an and Beijing Auto (BAIC). 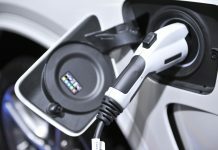 Other prominent vendors in the electric vehicles market established in China are Chery, Changan, Dongfeng Motors, FAW, Great Wall Motor Company, GAC and SAIC. 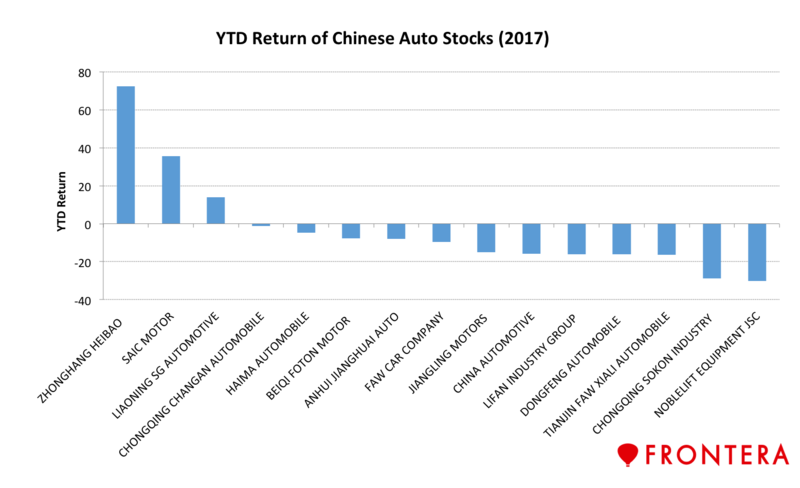 Year to date, the best performing auto stocks in China are Zhonghang Heibao, SAIC Motors and Liaoning SG Automotive. Shares of these companies have surged 73%, 36%, and 14% YTD. Valuations in the auto space look compelling with an average price to earnings multiple of 25.2x. 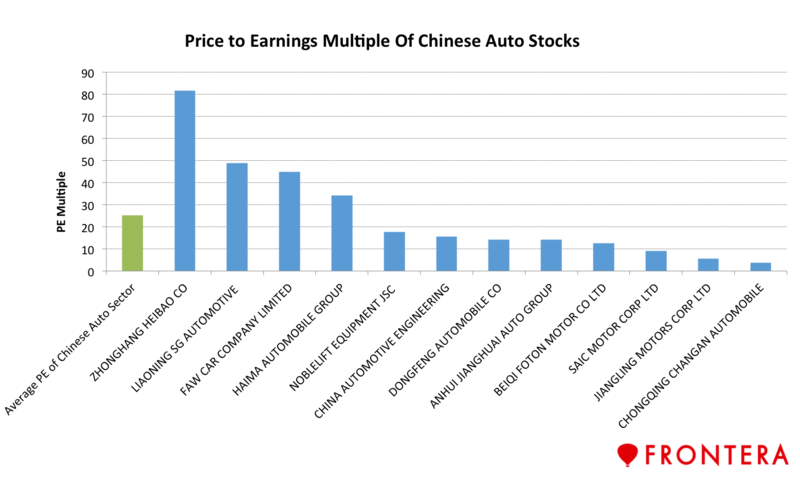 Chinese car makers Chongqing Changan, Jiangling Motors Corp, SAIC Motor Corp, and Beiqi Foton Motor are the most attractive auto stocks based on their inexpensive valuations. These stocks have one year forward PEs of 3.7x, 5.7x, 9.2x and 12.7x and are trading at the steepest discount to their peers. Meanwhile, Zhonghang Heiba. Liaoning SG Automotive and FAW Car Company are the most expensive auto stocks in China.